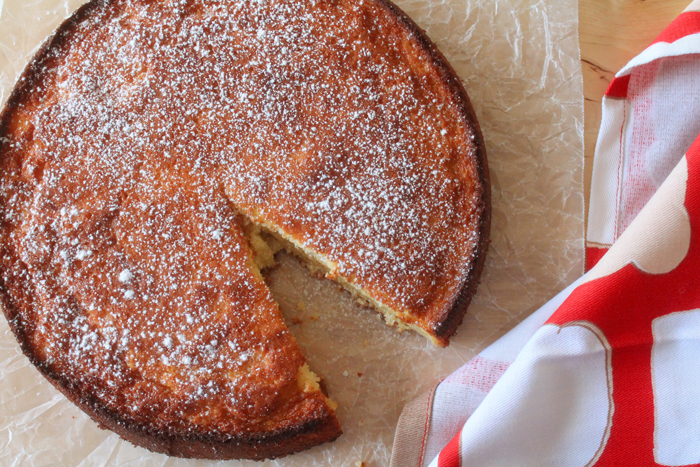 Meyer Lemon Butter Cake needs no frosting or frills. 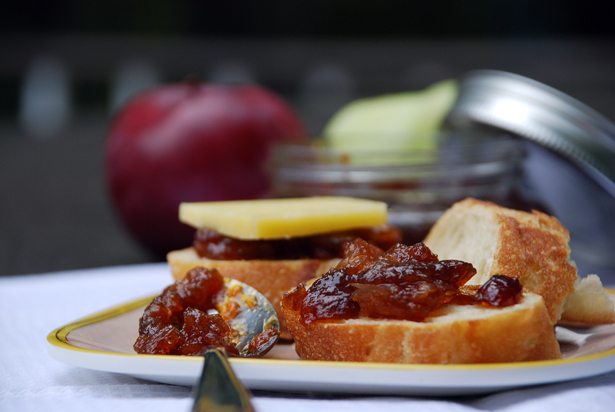 It’s light and sweet, and perfect for snacking. Here we are, y’all. New year, new you, right? Only, in my case, it’s new year, new site! I’ve been planning the move from Bluebonnets & Brownies to Bluebonnet Baker for more than a year. It took me a while to get up the gumption to do it, but now that I’ve taken the leap, I’m SO happy I did. I’m completely in love with this new design, new name, new header. Don’t you just love that gorgeous Bluebonnet flower? My extremely talented sister, Chellee, created the header for me. I love it so much I want to marry it.. you know, if I weren’t already married. Everything about the old site is still here, just hopefully in a prettier, more user-friendly way. There are still some kinks being worked out, (like missing photos), but they’ll be worked out over the next month or so, in-between full time job and wifing and mothering. So let’s talk about this gorgeous cake. I made it to celebrate the launch of Bluebonnet Baker. About a month ago, my dear friend, Cerys, sent me an entire box of Meyer lemons. An entire flat-rate shipping box full of Meyer lemons, from the tree in her yard out in California. That is friendship, you guys. James and I sat down one Saturday and made all things Meyer lemon to make sure we preserved everything those Meyer lemons had to give. We made candied Meyer lemon peel (She Wears Many Hats has a great post on it, if you want to make your own), Meyer lemon soda syrup, and fresh Meyer lemon juice for this cake. I knew immediately that I’d be making some sort of cake, and went to work looking through cookbooks and blogs for just the right thing. I like a frosted cake as much as the next girl, but let me be honest. With a 14 month old running around, ain’t nobody got time to make frosting, let alone store a cake in a fridge packed with sippy cups and half eaten bananas and oranges. 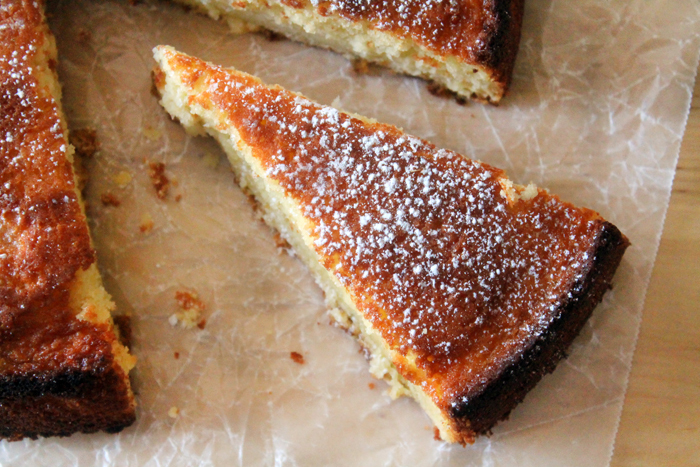 Then I stumbled upon a few different recipes for Olive Oil Lemon Cake. Each one looked light, with a generous crumb, and just a sweet dusting of powdered sugar. This is the easy cake I needed. I gathered all the ingredients and waited for naptime. Only.. somehow I missed an ingredient. 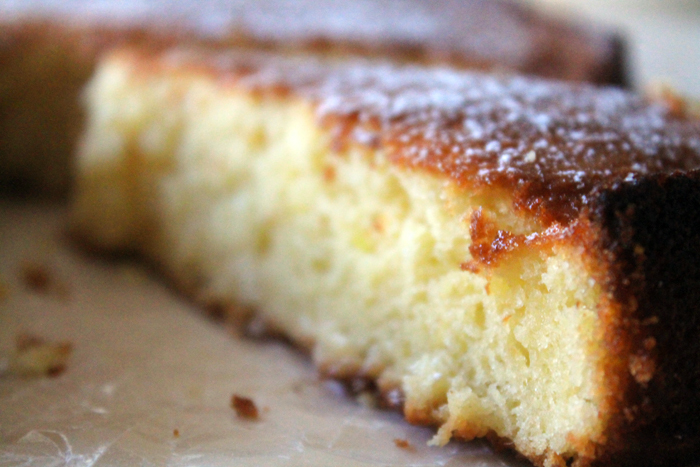 A pretty key ingredient, if you’re making Olive Oil Lemon Cake. We were completely out of olive oil! Carpe diem, I decided. Baking a cake happens so seldom around here, there’s no way I’d get my ish together again anytime soon. I looked around my kitchen.. Ahah! Plenty of Kerrygold Irish butter hanging out in the fridge. There’s nothing like grass-fed butter to take the place of olive oil, let me tell you. Now, I’ve never had an actual olive oil cake at this point, so I can’t speak to the differences when you use butter instead. What I can tell you is that this cake is so fantastically light! I feel no shame in admitting that I had a wedge or two for breakfast over the week, and it is a fantastic pick-me-up during naptime with a cup of tea. All you need is a dusting of powdered sugar, and you’re good to go! Thanks for such a quick response. I’ll definitely give that a try. I love anything lemon and definitely want this cake to work, so will try your suggestion and see if that works. Thanks again for responding so quickly. Hi Amber. Love the new site. Liked the old one, too, but your sister did a great job here! I have a question on this cake. I tried it, and it has a wonderful taste, but it came out super thin, like a pancake almost! I thought it was because I made a mistake and put the butter in the first one too soon. So I remade it. It still turned out super thin. I thought I used the wrong size pan, so I measured it….it was the right size pan, so not sure why it was so thin. I noticed that in the directions it said to mix the eggs, sugar, lemon juice and extract until light and fluffy; mine never got light and fluffy, just very liquidy. I used fresh lemons just picked from my son’s meyer lemon tree I let the butter cool, but not so that it solidified, so I’m not sure what I did wrong. Any suggestions? The batter, when poured into the springform pan, was very liquidy. I’d really like to try this cake again, but mine looked nothing like your picture….it was only about 1/2″ tall if that. As I said, it tasted wonderful…..but very dense. Thanks so much for your kind words about the new look! I’m not 100% sure why the cake is thinning out so much, especially if our pans are the same size. I’m wondering if your Meyer lemons are just a bit more acidic than mine were, and that’s preventing the eggs from fluffing up. Change up the order of how you’re mixing those ingredients. Add just the eggs and sugar to the mixer, and whip them on high so that the eggs start to get light and fluffy. Add the butter slowly to that, with the mixer still going, and then the lemon juice. Hopefully that’ll incorporate enough air to get your texture closer to mine. Everything is so, so pretty over here. Love the new look! Congratulations. Aww, thanks, Aimee! I love the look too. I hope your crew loves the cake as much as we did. Love you, sweet friend! The new site looks great! I love the design. Your sister did a great job on the header. Thanks, Wendy! I can highly recommend the site designer I used, if you’re still looking. First, I absolutely love this simple, beautiful cake! I’ve bookmarked it and will definitely be giving it a try very soon. Second, love the new look! It’s crisp, clean and much like this cake, the new site is beautiful. This looks absolutely incredible! I can practically taste how moist it is! Can you make this cake in a pan other than a Springform pan? I haven’t tried it, but I think you could probably make it in a regular cake pan. Just make sure to grease and flour the heck out of it so you can get the cake out once it’s cooled. I love the new site, and I love this cake!! I would totally eat it for breakfast, lunch, snack and then dessert after dinner. And then I wouldn’t be able to fit into my mother of the bride dress, but I’m not sure I’d care. Wish I had a lemon tree, but I don’t think one would make it here in Illinois. Just saying. Anyway, yum. Just yum. And congratulations on the site, too! Thanks so much, Julie! I’m so glad Stephie recommended Thauna. She did my site too! Definitely, Casey! What did you end up doing with yours? I have a little Meyer Lemon tree; I just got it last year and it has to go in and out each spring and fall. When I first brought it inside this fall it started to bud and literally had hundreds of flowers on it. That is now down to three. Sad yes but not surprising for it’s first year. This would be the perfect cake for my little harvest; something that really lets the lemon shine. Love the site and am beyond envious. I’m smack dab in the middle of doing the same and hope to pull the plug soon. LOVE the flowers and the name…great move! I tried to keep a Meyer lemon tree alive once. It did not go well. I’m envious that you’ve been able to, Barb. I know once you make the leap you will be so happy you did. It’s a lot of work, but I am SO much happier with the new name and new look. I’m so happy to see the new site up and running! 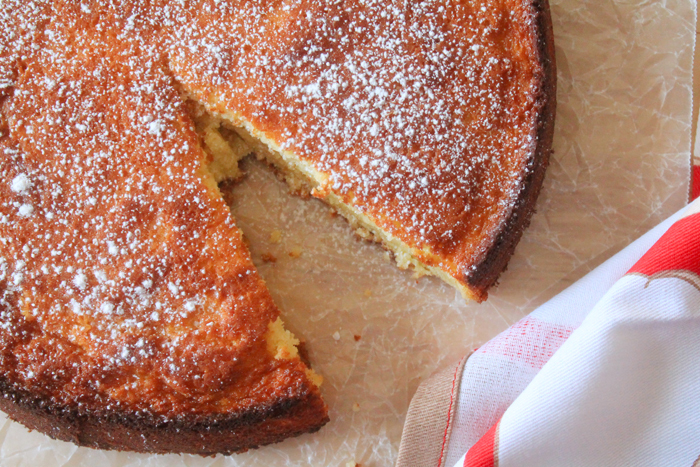 This cake sounds lovely – I bet it would be perfect for a brunch! Me too, Megan. Finally! We’ve been talking about it for a year. It would be FANTASTIC for brunch! Amber, love the new look! AND love Meyer lemons. I make a cake very similar to this. Keep meaning to make it with extra virgin olive oil sometime, but I just love it with good unsalted butter so much that I never quite get around to the olive oil. Oh well, right?! Kudos to your talented sister on the lovely new header. Thank you so much, Jean! I’m sure my sister will very much appreciate the compliment. I can’t decide if I’ll ever get around to making this cake with olive oil either, because butter was dang good! Oh man, this butter cake looks awesome!! I love the meyer lemons in there! Meyer lemons are pretty much my new favorite thing, Katrina!